After a summer of camping, it was great to get back to the fall/winter routines. Two days ago, the last piece of garden furniture was tucked away and the gutters cleaned, just as much needed rain began to fall. Today, a very warm, muggy day that is unusual in Victoria. Earlier in the day we ran into a friend, Tanya Beatty, an avid baseball fan, who spent time California this summer and attended an Oakland A’s game. Although she had not yet seen the movie Moneyball, she heard it was very good so Lynn and I scooted to Silver City and were fortunate to catch a seat. The movie was an excellent recommendation. 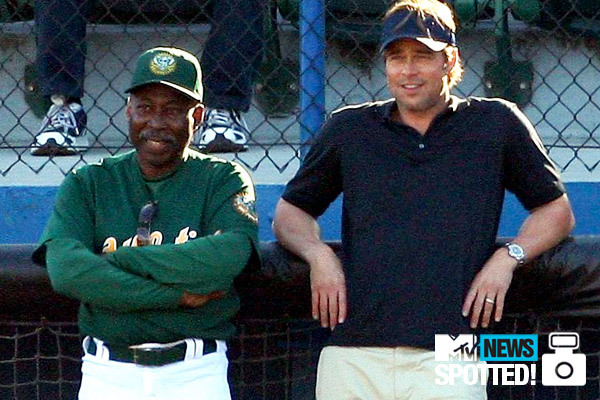 Brad Pitt, plays Oakland A’s manager Billy Beane who, wanting to do something different, took a chance and hired a statistician Jonah Hill (Peter Brand) as one of his scouts. Together they worked toward building a winning team with very little money. Hill had developed a system of tracking players that ran counter to traditional baseball wisdom and as a result he and Billy had to overcome a great many challenges as others worked to thwart them at every turn. The story line is at the same time exciting, humorous and sad, as players, general managers, coaches, scouts and others struggle to survive in the unforgiving system that is Major League baseball. Each of the many characters in the movie play their parts well and five minutes in you will be glued to the story line and rooting for the protagonists. Whether or not you like baseball, Lynn and I are certain you will enjoy this movie and give it four thumbs up. Thanks Tanya for the suggestion.